With all this dreary winter weather in Toronto, hearty and filling main dishes are one of the things that we crave most. Although a cheesy rich classic lasagna sounds so appealing, most of our clients can’t eat cheese and gluten. So, we came up with something just as good that’s dairy free and gluten free. This lasagna is full of saucy, baked tomatoes paired with creamy and rich “cheese” that’s made from cashews and slightly sweet pumpkin. 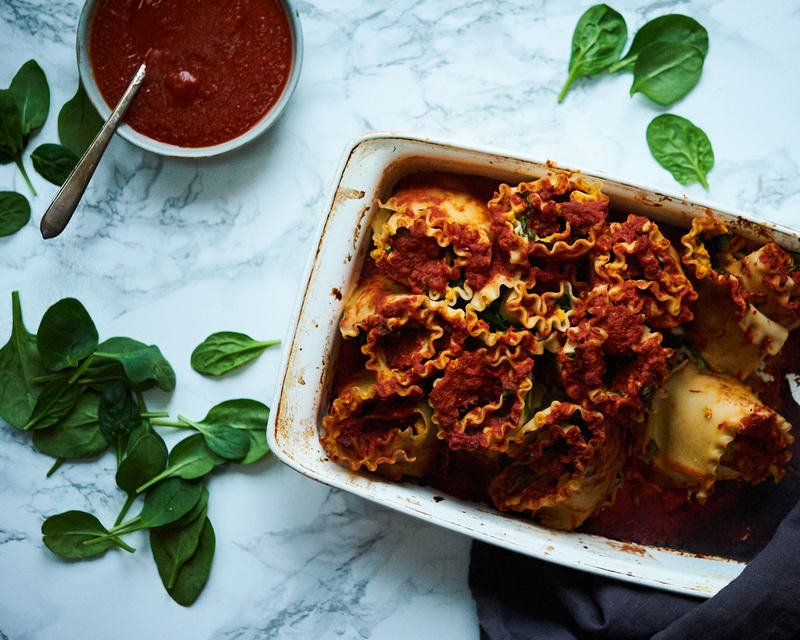 We love making this version of lasagna rolls instead of layering the lasagna noodles in a dish because it’s easy to serve out and looks more interesting than a standard lasagna. 1. Soak the cashews in a bowl with hot water for 30 minutes to 1 hour. 2. Meanwhile, cook the lasagna noodles in a large pot of boiling water for 8 minutes (you want them to be al dente, not completely cooked). Then strain out of the pot and cool down under cold water. 3. Slice the mushrooms in thin pieces. Chop the baby spinach or kale. 4. Once the cashews are softened, drain out of the bowl. 5. Place all of the ingredients for the “cheese” in the food processor and blend until creamy. You can add a few spoonfuls of water if needed, to get the mixture blending. Don’t add too much water though, as you want the mixture to be thick and a similar consistency to ricotta cheese. 6. Lay the lasagna noodles out on a flat surface, such as a cutting board or large flat plate. 7. Carefully spread the “cheese” mixture over each lasagna noodle. Sprinkle chopped mushrooms and baby spinach or kale over top of this. 8. Then take one edge of each noodle and roll over on itself tightly. 9. Spread around 1/2 cup of marinara sauce on the bottom of a baking dish. 10. Place the lasagna rolls on top of the sauce, leaning them against each other. 11. Pour more marinara sauce over top of the lasagna noodles (add as much as you like). 12. Cover the baking dish with aluminum foil and bake in the oven at 350 for 30 minutes.